2 What are Bleeding Gums? 3 What are the Symptoms of Bleeding Gums? 4 What are the Causes of Bleeding Gums? It is a sign or symptom that you have or may develop a gum disease but it can also indicate other health issues. At times, bleeding from gums can occur while brushing your teeth in a harsh or rough manner. Ill fitting dentures or improper flossing can also cause gum bleeding. In case of frequent or recurrent bleeding from gums can be an indication of a serious health problem. That is why it is essential to find the reason behind it. Dental care is necessary, otherwise, they can become the main reason of bleeding gums. People suffering from Gingivitis and periodontitis are more likely to get bleeding gums. Deficiency of vitamins can also lead to the bleeding gums. It includes vitamin C and vitamin K.
Who is at Risk of Bleeding Gums? Certain Medications: medicines including anti-depressants, heart medications and oral contraceptives can also lead you to bleeding gums. In homeopathy, there are a number of remedies to cure the problem of bleeding gums. 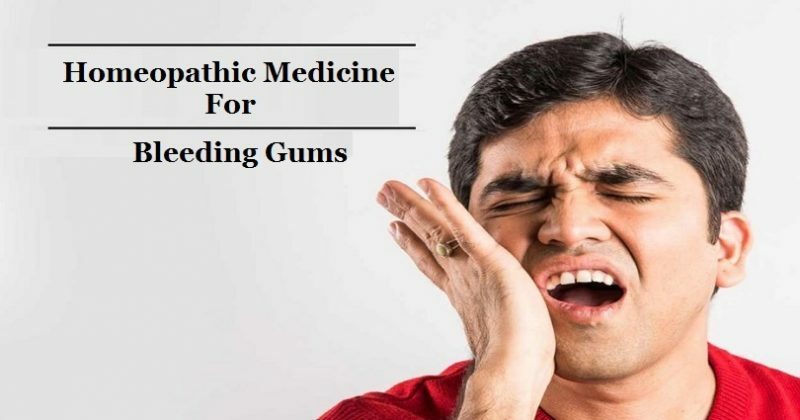 In addition, homeopathic medicines for bleeding gums also help the patient to manage the attended symptoms including pain, swelling, tenderness, pus discharge from the gums and sensitivity of the gums. These remedies are devoid of side-effects because they are made of natural origin and safe to use. Their objective is to eradicate the main cause behind the bleeding of gums and make sure a good recovery. The best homeopathic remedies to cure bleeding gums are Merc Sol, Phosphorus, Kreosote, Hamamelis and Bovista. Merc Sol is the best homeopathic medicine for bleeding gums in cases of gum infection or inflammation aka Gingivitis. The gums of the patient are red, swollen and painful to touch in cases where the patient needs this medicine. Swelling of the gums mostly occur at night and there is a burning sensation in the gums with pain and swelling. The gums are receding, spongy and may be partly destroyed along with the loosening of the teeth. Furthermore, there is a putrid, fetid odor from the mouth is also present. There is copious saliva in the mouth as well. Along with above symptoms, metallic taste in the mouth is also observed. Kreosote is another top rated homeopathic remedy to cure bleeding gums due to gum inflammation. The gums of the person are soft, bluish red, puffy, inflamed and may be ulcerated. Bleeding from the gums of the person is dark red and slightly coagulated in nature. Teeth pain and decaying of the tooth may also be present. Silicea is another homeopathic remedy for gums that ooze blood and pus because of gum infection. The gums of the person are inflamed, sore and very sensitive. Gums cannot bear the slightest pressure. Along with the above symptoms, the looseness of the teeth may also be noted. The tooth may be decayed along with pain especially at night and it can be tearing and throbbing in nature. Homeopathic remedy Hepar Sulph is beneficial for bleeding and tender gums. Bleeding and pain from the gums occur from slight touch. The gums have a pain that is throbbing in nature. Furthermore, ulcers also occur on the gums and the taste of the mouth is bitter in nature. Natrum Mur is another homeopathic medicine for swollen gums with bleeding. In addition to swollen gums, swelling of cheeks is also present. The gums are sensitive to both warm and cold things. There is a burning sensation in the gums which is felt while eating. Ulcers on the gums are present and they are painful in nature and hurt the patient day and night. Homeopathic medicine Phosphorus works well in cases of bleeding gums that occur after the slight touch. The bleeding from gums is profuse and the teeth may get loose from the gums. Gums may be swollen and ulcerated as well. This homeopathic remedy is also prescribed for persistent bleeding that occurs after tooth extraction. Homeopathic remedy Hamamelis is made from fresh bark of twigs and root of a plant called Hamamelis Virginica. It belongs to the natural order Hamamelidaceae. It is useful for bleeding from the gums when it is dark fluid in nature. The gums of the person are swollen, sore and spongy and they are also painful too. Exhaustion and weakness may associate bleeding from the gums and it indicates the usage of this medicine. Bovista is another useful homeopathic treatment for the problem of easily bleeding gums. The patient of this medicine tends to have frequent episodes of bleeding from the gums. Bleeding from gums even start from sucking. Homeopathic medicine Bovista is an ideal medicine for bleeding from gums where it is marked at night time. It is another homeopathic remedy which is recommended for controlling bleeding that follows tooth extraction. This homeopathic remedy treats the cases of bleeding gums that occur upon cleaning teeth. The gums of the person are painful and sensitive. The pain can also be observed while chewing. Gums may also develop ulcers. There may be associated symptoms of looseness of teeth and receding of gums in cases where Carbo Veg works well. Calcarea Carb is also highly recommended for bleeding gums accompanied by pulsating/stitching pain in gums. The gums are inflamed with swelling of the cheeks. Along with these symptoms, foul odor from the mouth may also occur.